Get ready for your Mardi Gras celebration with this stunning green, gold, and purple Mardi Gras Tableware pattern. This Mardi Gras tableware set incorporates the primary green, gold, and purple colors with some familiar icons like the fleur de lis. Throw your very own Mardi Gras party! You don't have to be in New Orleans to enjoy Mardi Gras this year. Bring some of that Louisiana charm to your own home. Make your Mardi Gras party complete with the help of our tableware. 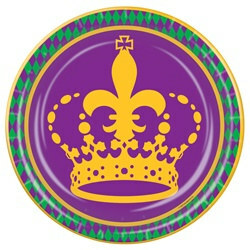 Our Mardi Gras themed tableware features a large crown graphic on the front of the plates. The tableware follows the classic Mardi Gras color scheme: purple, green, and gold. For lunch and dinner, try using these Mardi Gras Lunch Plates, which are 9 inches in diameter or our Crawfish Lunch Plates. These plates are perfect for larger meals, like sandwiches, burgers, and other lunch items. For smaller plates, try our Mardi Gras Dessert Plates. These plates are slightly smaller, measuring in at 7 inches in diameter, which is the perfect size for a piece of delicious cake or pie! No matter what kind of Mardi Gras table decorations you're looking for we've got you covered! We're PartyCheap.com and we know how to party! At any party, spills and messes are bound to happen. Be prepared with our Mardi Gras napkins! These napkins come in two different sizes, and match the plates perfectly. They feature a purple and green checkered pattern, with a gold border around the edge. The Mardi Gras Lunch Napkins are larger, measuring in at 6 1/2 inches by 6 1/2 inches. Our Mardi Gras Beverage Napkins are slightly smaller, measuring 5 inches by 5 inches. Cover your table in these mardi gras table decorations and you’re sure to be the talk of the neighborhood! You can also try out our Mardi Gras centerpiece which is sure to be the center of every conversation because it is literally bursting with color! And of course we always love hearing from our very loyal customers! If you have any questions or ideas for new products feel free to give us a call or leave us a message! We’d be happy to hear from you! And who knows? You might just see your idea on our website in the near future! No matter what kind of mardi gras table decorations and other party decorations you’re looking for we’ve got you covered! We’re PartyCheap.com and we know how to party!